Summary: In today’s beaded necklace designs, we’ll show you how to make a beaded necklace features a handmade beaded ball pendant out of faceted oval glass beads and see beads. The following beaded necklace design is prepared for the upcoming Halloween. Halloween is a pretty great time for wearing handmade fun jewelry accessories, so just check out this beaded ball pendant necklace. 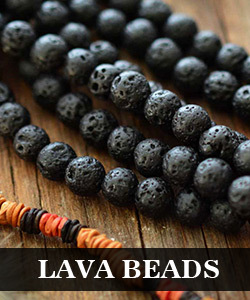 The pendant is made with faceted oval black glass beads and 3mm orange seed beads. Here we go! How to make the beaded ball pendant necklace? This will be a complete element of entire beaded ball. 8th, after several times you’ll get the ball finally. 2nd, keep 7mm at the other pin end and make a simple loop with it. 3rd, add the beaded ball pendant and decorative elements. Close the loops securely and you’re done! 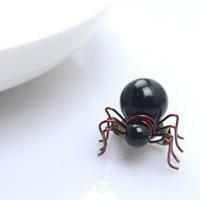 Get this lovely and fun beaded ball pendant just in time for this October. What’s more, you can also try the pendant with some ingenious earrings or bracelet making ideas. That must be extremely exciting!